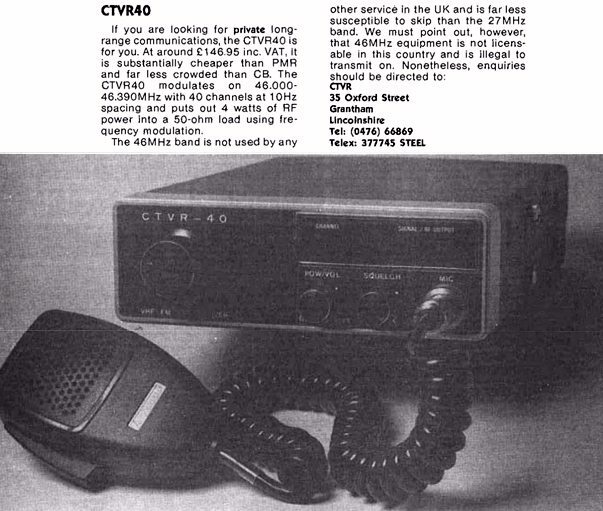 C.T.V.R 40channel 49mhz mobile rigs! a long time ago, a company called C.T.V.R. imported a beautiful 49mhz mobile rig and 6 channel 5 watt handheld into the u.k. - with the sole purpose of trying to jump start 49mhz as a new cb band. they actually went on sale; but by the time a few had been sold; the powers that be closed the company down and destroyed the remaining radios. Now i always wanted a 49mhz 40 channel rig. we had crystal controlled 49mhz base stations (i now have two, G.E. 3-5940A base stations) and they worked beautiful. so if you see some, anywhere in the world, i want to know about it!! Hi, I have a pair of these. They are not on 49Mhz though, they are 46MHz. Re: C.T.V.R 40channel 49mhz mobile rigs! bringing this old thread alive..
i have four of these CTVR radios..
two are Sirtel searcher (Maxcom 4E) type radios with 46mhz transverters installed. the other two are the genuine CTVR-40 radios, and work..!! very well built and 4w out, but yet to try on an antenna..
love to know what happened to the other 46mhz radios out there and if anyone ever uses them ?? I want to die asleep like my granddad did. Unlike his passengers, Screaming and shouting..!